Exulted Ruler John Hern stands beside a sign near the entrance to the Hillsboro Elks Lodge at 451 Danville Pike. Gary Boatman stands behind the bar at the remodeled Sand Trap Lounge at the Hillsboro Elks Lodge. Officials at Hillsboro Elks Lodge 361 say they are trying to breathe new life into the organization. A new and completely remodeled restaurant opened six weeks ago, membership is up, the lounge and game room have received a facelift, and new activities are being planned. Earlier in its 121-year history, the Elks lodge was a place where families could come and enjoy time together, organizers said Wednesday. But over the years, warranted or not, it became known more as a golf course and bar. That is the image the organization is trying to shed. “It’s a place where young and old can come together and have a good time, and it’s great,” Exulted Ruler John Hern said. “That’s what we’re trying to get back to. We used to have a lot of events going on, but that kind of went away, and that’s what we’re trying to get back to,” said Diane Jones, president of the Hillsboro Emblem Club that serves as an auxiliary to the Elks. Many may not know that the Elks is also a community service organization with three main areas of focus – youth, veterans and those with special needs – all with patriotism at its core. In fact, Hern said, members have estimated that since the local club’s inception in 1897, the Hillsboro Elks has given back more than $1 million to the local community. During its current fiscal year, he said it donated approximately $17,000 to community projects. Jones, who will be state Emblem Club president in 2020, said that in today’s world, many young parents have become so caught up in their kids’ activities they don’t have enough time to contribute to their community. The new restaurant at the lodge, named the Frog and Club, is open five days a week – Wednesday and Thursday from 4-9 p.m., Friday and Saturday from 4-10 p.m., and Sunday from 11 a.m. to 3 p.m.
“I think it’s as fine a restaurant as there is in the area, and it’s a wonderful addition to what we offer,” said Gerald “Buzzard” Wilkin, who works with veterans and youth for the Elks. At the beginning of this year the Hillsboro Elks had 216 members. Now it has 243, according to Hern. 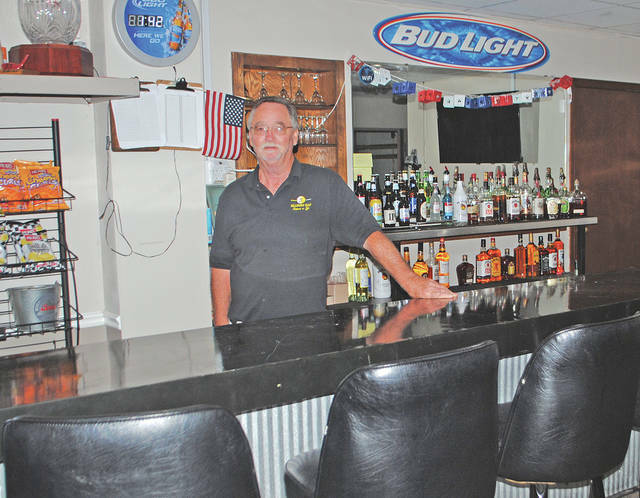 The 60-year-old bar and lounge, open to members and invited guests only and now called the Sand Trap Lounge, has been remodeled into a more comfortable sports lounge, according to Gary Boatman, the club manager. He said it has three TVs, a re-covered pool table, dart boards, a Ping Pong table, other games and more. He said the lounge recently hosted Ping Pong and beer pong tournaments in an effort to attract a younger crowd. The lounge is open from 8 a.m. to 8 p.m. Monday, Tuesday and Wednesday, 8 a.m. to 11 p.m. Thursdays, 8 a.m. to 10 p.m. Friday and Saturday, and 8 a.m. to 6 or 7 p.m. Sundays. Golf is open to the public seven days a week. The course can also be booked for tournaments by organizations. An Elks membership is $80 per year. Those interested have to be sponsored by a member, be 21 or older, be a U.S. citizen, believe in God, and cannot be a felon. Both men and women are welcome. Ritchie Butler, who helps oversee the golf course, said the national organization’s beginnings stem from a group of actors called the Jolly Corks, who started meeting in 1867. At first, he said, it was a social group, but some members decided they wanted to make their mission geared more toward serving their New York community. He said the first Benevolent and Protective Order of Elks (BPOE) meeting was held in February of 1868. “Elks is an American organization with patriotism at the heart of it,” Butler said. He said that nationwide, there are more than one million Elks members, more than 200,000 lodges, and that since its inception Elks organizations have contributed more than $3.6 billion in cash, goods and services. Dan Pearce works with the Elks National Foundation to secure local grants and organizes community service projects. 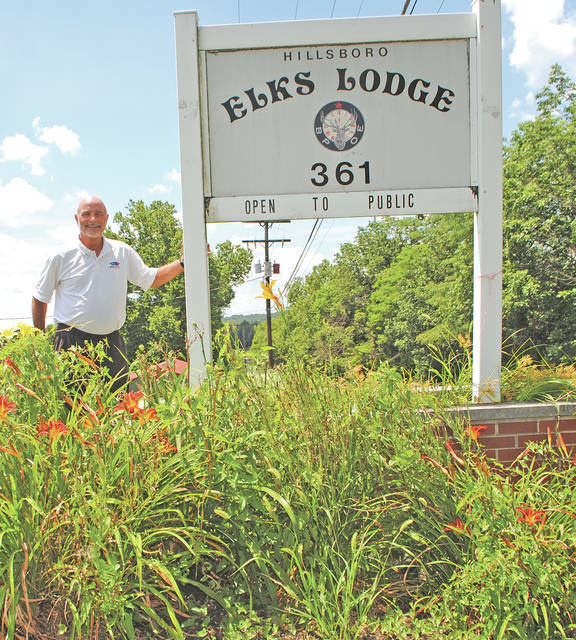 He and Martin said the Hillsboro organization has participated in almost every district, state and national Elks project available since its inception. https://www.timesgazette.com/wp-content/uploads/sites/33/2018/07/web1_Elks-pic1.jpgExulted Ruler John Hern stands beside a sign near the entrance to the Hillsboro Elks Lodge at 451 Danville Pike. https://www.timesgazette.com/wp-content/uploads/sites/33/2018/07/web1_Elks-pic-2.jpgGary Boatman stands behind the bar at the remodeled Sand Trap Lounge at the Hillsboro Elks Lodge.